It’s been a while since I posted, in part because I’ve been figuring out my new gig. Last fall, and in addition to my position as Library Director, I was appointed Executive Director for Community Arts & Culture for the Town of Chapel Hill, NC. Now that I’ve gotten my feet more than a little wet with this new job, I have made a New Year’s resolution to post more here on the website. To ease into that, here’s what will be the first in an occasional series on what I’m reading and writing. I’d love to hear from you about what you are reading and writing these days as well – so post in the comments if you care to share. The Art of Relevance by Nina Simon Part of my new portfolio includes planning for a new history/culture center in town, so I’ve delved into the world of current thinking about museums and public history. I came across Nina Simon’s work and am now more than a little obsessed with her and her thinking. This is a highly readable and highly inspiring read – and it hews closely to the work we’ve been doing at CHPL with User Experience. 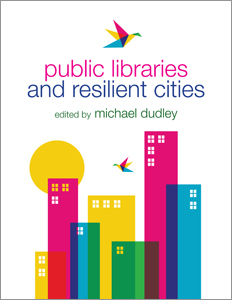 Public Libraries and Resilient Cities edited by Michael Dudley Leading a municipal library – we are a department of the town just like Police, Fire, Planning, Parks, etc – has shown me new and different opportunities for public libraries to leverage their strengths to contribute to the city or town’s goals. I’ve written about this myself, and continue to think and talk about public libraries and local government. Dudley and others have clearly been thinking and talking about this as well. Through analysis and case studies, this book articulates the public library’s position in the ecosystem of the city or town – and describes how libraries can play a role in urban planning, community revitalization, and more. Both of these books take a familiar term – relevance and resilience – and create a fresh understanding of the possibilities at hand in our profession and in our organizations, as well as offering a new mindset and way of creating meaning and value. Good stuff. ICYMI, I wrote the cover feature for the Sept/Oct 2017 issue of Kathy Dempsey’s Marketing Library Services newsletter – all about creating a user-focused website at Chapel Hill Public Library. I’m currently working on the next in a series for Novelist, called “But My Book Club Doesn’t Read _____.” This series encourages book clubs to “read outside the lines” of the usual book club selections and explore genre fiction. I’ve tackled mystery, science fiction, westerns, romance, and horror over the last year or two. Next up – and probably live on the Novelist site in March – is fantasy. Because, believe or not, Merlin pairs well with merlot at Book Club Night.